Healthy guinea pigs are active and alert. 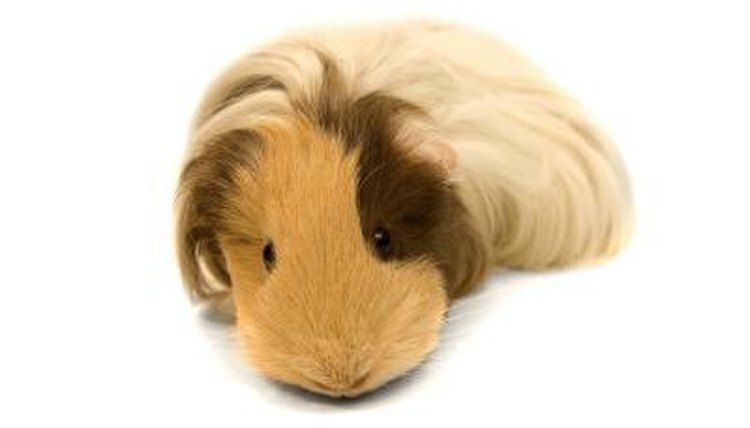 Sick guinea pigs are lethargic, moving around as little as possible. If your normally active pet stays put in one place for a long time, looking dull, take him to the vet. When guinea pigs get sick, they can go downhill very quickly so time is of the essence if you think something is wrong with your pet. Besides alertness, a healthy guinea pig eats well and defecates normally. His feces should be firm and moist, not loose or dry. His coat should look shiny, not dull. His eyes should appear the same way - shiny and bright, without a dull look. If you want to play with him, he should respond in his typical friendly manner. If you have any concerns about your guinea pig, take him to the vet. That might not be the same vet who cares for your cat and dog. Guinea pigs and other rodents have special veterinary needs, so you should find a vet specializing in "exotics" before an emergency arises. Besides inactivity, sick guinea pigs often appear hunched-over. As prey animals, they don't want to draw attention to themselves when they're unwell. In their native Andes, obviously sick guinea pigs were easy picking for predators. Besides experiencing diarrhea or constipation, sick guinea pigs might drool; stop eating and drinking; exhibit breathing difficulties; lose balance, or have an eye or nasal discharge. Your pet's abdomen could appear bloated or he could have blood in his urine. Take your pet to the vet immediately if he displays any of these symptoms. According to The Merck Manual for Pet Health, pneumonia is the most frequent cause of death in guinea pigs. Although guinea pigs are sensitive to many antibiotics, there are some they can tolerate for pneumonia treatment. Gastrointestinal stasis occurs if guinea pigs stop eating, and can be fatal within 24 hours. Slobbers, resulting from dental malocclusion, can indirectly cause gastrointestinal stasis because it eating is painful. If your guinea pig receives too much calcium in his diet, he could develop bladder stones, which are not only painful but can be life-threatening if they block his urethra and he can't pee. While you can't prevent all guinea pig illnesses, certain practices make it less likely that your pet will get sick. Guinea pigs should always have access to fresh, clean water. They also need timothy or grass hay available 24/7. The hay not only aids in keeping their intestines moving and working properly, but wears down their continuously growing teeth, preventing dental overgrowth. Since your guinea pig can't manufacture his own vitamin C in his body, he needs a constant source. Chicago Exotic vets recommend grinding up children's chewable vitamin C tablets every day and sprinkling it on your pet's food. Lack of vitamin C causes skin infections, foot and dental issues. Keep his cage clean and his life as stress-free as possible. Guinea pigs are susceptible to heat stroke, so keep his cage out of direct sunlight.